we are here to help you get your vehicle back on the road. 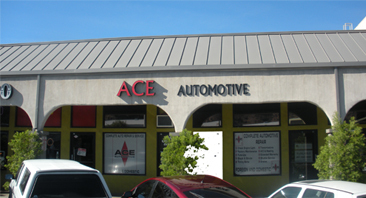 Ace Automotive of Santa Clarita, CA is a reliable auto repair center that specializes in domestic & most imports. With factory trained and ASE certified specialists on-site, customer satisfaction is what we strive for. We honor extended warranties. Shuttle service is available in the local area. We are a member of the Automobile Club of Southern California. We provide the following auto services and much more... Give us a call today! To schedule an appointment Or If you happen to be nearby feel free to come by to set an appointment in person.